Posterior hip replacement is one type of approach that may be used during total hip replacement surgery. As with any type of total hip replacement, the surgery is used to improve the function of the hip joint and decrease discomfort in the hip. Hip replacement is generally needed when a patient has suffered from cartilage deterioration in the hip joint, known as arthritis. There are two types of arthritis that commonly require total hip replacement – osteoarthritis of the hip and post traumatic arthritis of the hip. When one of these joint conditions is present and does not improve with conservative treatment methods, posterior hip replacement surgery may be a good option. After a thorough evaluation, Dr. Sculco will recommend the specific hip replacement approach that is best suited for each patient’s unique needs. In some cases, hip replacement surgery can also be completed using computer-assisted navigation in order to help improve accuracy and precision. What is the difference between posterior hip replacement and anterior hip replacement? 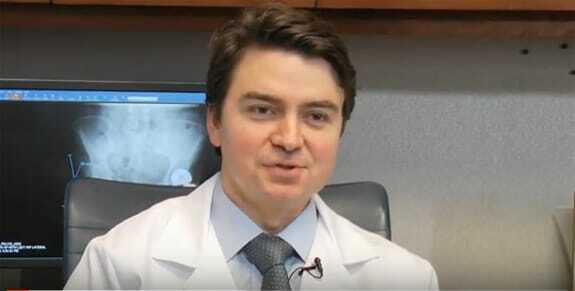 Dr. Sculco employs Intellijoint HIP, which is an advanced surgical tool designed to help orthopedic surgeons more accurately perform posterior hip replacement surgeries and improve patient outcomes. The tool gives Dr. Sculco pinpointed accuracy when placing your hip implant, lowering the risk of future dislocation and other post-surgical issues that could result in the need for revision surgery. What are the advantages of the posterior hip replacement approach?